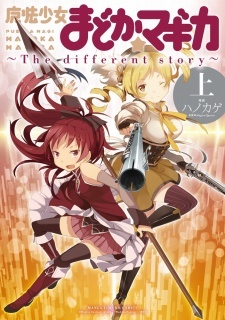 The Different Story is a three-volume manga spin-off for the Madoka Magica Movie. The first volume begins as an adaptation of the 3rd Drama CD, which details the events through which Mami and Kyouko meet for the first time and become witch-hunting partners. Ultimately, it culminates in an alternate timeline with a different outcome from the timelines shown in the anime. Mahou Shoujo Madoka★Magica: The Different Story was published in English as Puella Magi Madoka Magica: The Different Story by Yen Press from March 25, 2014 to October 28, 2014; as well as on eBook format on June 23, 2015. Before you consider reading "Mahou Shoujo Madoka★Magica: The Different Story". It is highly recommended that you either watch the original anime series or read the manga adaptation (both called Mahou Shoujo Madoka★Magica) due to the Different Story not only referencing events from the original but it was pretty much written under the premise that the reader has seen the original. That said I will keep spoilers to a minimum for both the original and Different Story so both people who are familiar with the original series and those who aren't can still read this review. Mahou Shoujo Madoka★Magica: The Different Story is actually BOTH a prequel and alternative universe of the popular Mahou Shoujo Madoka★Magica series. The premise of both Madoka Magica and the The Different Story is pretty much a darker take on a "Magical Girl" setting. If you've seen or read a magical girl series like Cardcaptor Sakura, Sailor Moon or Precure you know magical girl series are usually happy/optimistic series with tons of friendship/love speeches aimed at kids (not this is a bad thing). The Different Story takes a darker and somewhat more realistic approach on the genre, with the big question being.. "Is it really ok to take on the responsibility becoming a magical girl just for one wish?" Despite the fact that this manga is called MADOKA Magica, the title character Madoka Kanme is only a minor character in the Different Story. The actual main character is Mami Tomoe, a character who only got a little bit of screentime in the original series. The art style in this series is very good and detailed. It comes very close to the style of the original series. The action scenes are decently detailed for a manga though not quite as good as they are done in the original anime. The first 4 chapters serve as a prequel to both the original series and the rest of "the Different Story". Mami Tomoe is a somewhat experienced magical girl yet keeps it a secret from all her friends at school. When not at school she tends to be a bit lonely. That all changes when she meets Kyouko Sakura, someone who has just recently made a contract to become a magical girl. Kyouko is quite inexperienced with fighting so Mami gives her advice to defeat the witch (the "enemies" of this series) she was fighting and helps her defeat it. After that they become friends and begin to fight alongside each other. However, after a while certain complications begin to rise and the story really starts to kick in. The rest of the series mostly explores Mami Tomoe's character answering questions like "What does she really fight for?". Kyouko Sakura also gets a bit of development but not quite as much as Mami. There are 4 other characters who are quite minor compared to the Mami and Kyouko but still play a decent part of the series. Sayaka Miki and Homura Akemi are magical girls who appear later on in the story. Madoka Kaname, the title chraracter is someone who is deciding whether she wants to be a magical girl or not. Kyuubey is a little cat-like creature who gives girls the power to become magical girls. The rest of the story is a bit hard to explain without spoilers but if you're really interested to see a more unique take on a magical girl series that explores bonds with others on a somewhat deeper level than most of the genre then you should definitely check this manga out. then you should most definitely give this manga a try. Mahou Shoujo Madoka★Magica: The Different Story is adapted from one of the Drama CD's of the Madoka Magica franchise. It's set in the past right after Kyouko contracts as a Puella Magi and ends up meeting up with magical girl Mami. The story has more or less of a lighthearted feel and goes deeper into the past that connected these two girls, and also helps explain some of their motives in the present time. Like the parent story, it has its touch of lightheartedness in the beginning but soon takes a much sharper turn. With only three volumes and twelve chapters, the pacing can feel a bit fast to some, though it isn't something you shouldn't expect if you're familiar with the pacing in the anime. Regardless, this isn't a manga that you should rush or skim through. It's definitely one that deserves to have it's detailed noted, seeing as everything will fall into place come the later chapters. The story is important for our two characters, Mami and Kyouko. Not only does it prove more screentime for Mami, who got a meer 3 episodes in the anime, but it also gives more depth to her character and personality. Same can be said for Kyouko, who's backstory and family situation is covered much more then in the anime. In a sense, this story is far too important for their characters to be left unanimated, especially considering one of the main complaints for Madoka Magica was the lack of character development. With that being said, the lack of character development is definitely not an issue here. The manga takes us further into the minds and motivations of both Mami and Kyouko. Two characters who before could be described with one or two words are fleshed out and explored wonderfully in this manga. It gives justification and background to many of their actions, something that the anime fell short on doing. This is easily the strongest aspect of The Different Story, and is the very thing that makes it such a must-read. Art wise, The Different Story is most definitely an improvement from the original Puella Magi manga. While no mangaka can live up to SHAFT's art direction and style, it's definitely not an eyesore to look at it and you can tell there's been quite a lot of improvement from it's source manga. If you aren't familiar with the Puella Magi franchise, it's recommended that you at least watch the anime before jumping into this manga. It's quite an enjoyable read for those who are fans of the anime/manga and can be for those who want more from these two characters. It definitely does them much more justice and is well-worth the read. Oh yeah, you may cry too. Or was that just me? When I started getting into the world of Anime and Manga Madoka Magica was one of the earlier things that I watched. I really enjoyed it, fell in love in fact. However this isn't a review about that story. This is a different story, another tale, from another time. The "Different Story" locks in on the struggles of two different characters from the original show. Centered around Mami and Kyouko, this tale delves into a previously unseen life that happens per-original series. Going deeply into the roots of who these "new" characters were, as well as complementing the original work wonderfully. A "Different Story" to sum it up in a short manner, it was fantastic. Well paced and great supplement to the already existing universe. I actually liked this tale much more than the original. I'll go more into the reasons why in the "Character" section of the review. I don't really know what else that would describe the artwork in this except "Great". Character designs and actions scenes were well designed and fluid. It was like I was watching an Anime. Can I give any greater complement? Mami and kyouko are just better to focus on in the story. I was way more attached to both of them then say Madoka or Sayaka in the original show. This story added much needed depth to Mami as a character. She was my hero for this tale, but Kyouko gets a big A for effort. The chemistry between these two made me invested in their struggles, way more then say Madoka's. Speaking of Madoka, the rest of the old crew shows back up. All of them are who you remember from the original show, so no added content, but the stronger pull of the two MCs was more than enough to earn high marks in this regard. The focus on these two are what make this better than the original tale. I adored this manga a lot, and I had a great time getting back into the world of Madoka Magica. If you are a fan of the original series then this is a must read. I would recommend it in a heart beat. Although I believe you can read this with out technically watching the show, I'd still say it works really well as a supplement. So I would recommend watching the show first. All in all great read. I can't believe this manga is one of the excellent mangas ever made! Mami Tomoe, the character whom people overshadow her character with head jokes in episode 3 is developed the best here. When I first heard of this manga, I was confused as to why people cherish it so much since Mami hardly interested me that time. But once I've started to read this manga, I've found myself infused with her character just as much as Sayaka in the anime. Though the anime is way ahead of Precure and Tokyo Mew Mew (even though I like these animes too), I for some reason found this manga more inspiring because it explains every character's themes that even the anime itself had shortcomings because of it. The story basically starts with Mami befriending Kyouko (who was a naive hero of justice like Sayaka) but when the time came when Kyouko's family died, she starts betraying Mami. Tbh, although I love Kyouko, I hated it when she betrayed Mami because of the tragedy. This ended up with Mami being lonely and sad. Mami then tried to befriend Sayaka but Sayaka to her low self esteem abandons her because she feels inferior to her. This made Mami even more lonely and sad to the point that she wants to die with her. I really feel sorry for her because she is doomed to live alone with no one to have fun tea parties. Anyone who creates head jokes and claims that Mami is 'forever alone' should read this manga. In fact this manga is like a deja vu in the sense that I also faced a similar kind of situation when I was in 5th grade. My friend whom I've visited her house many times suddenly betrayed and abandoned me for no reason just because she got tired of speaking to me all the time so I had the exact same reaction as Mami did in the manga and I felt lonely once again. In fact she is now tied to Kyouko as my third favorite characters.